The DURASEAL™ III-NV is a patented multi-finned flexible gasket which produces a positive water-tight fit wherever a pipe makes contact with a manhole base. It becomes an integral part of the pipe and cannot slip, twist or dislodge. The DURA-SEAL™ III-NV works on pure compression, thus eliminating the need for installation kits, take-up clamps or additional tools. This makes installation in the field possible in either wet or dry conditions. The contractor simply lubricates the pipe and inserts it into place. This time-saving product provides you with top-quality, increased efficiency and improved cost effectiveness, all in one package. The DURA-SEAL™ III-NV can accommodate any size (up to 24″) pipe and any material, including asbestos cement, vitrified clay, concrete, cast iron and PVC. It is ideal for manholes, wet wells, valve pits and septic tanks. DURA-SEAL™ III-NV meets or exceeds all material and performance requirements of ASTM C443 and C923. It is covered under one or more of the following patents: Number 3,787,061; Number 3,759,285; and Canadian Patent Numbers 949,094 and 1.018,331. Recent tests certify that DORSALLY™ III-NV can withstand 3760 force lbs. (1880 lbs. each end) with zero leakage. For complete test results, ask one of our representative for Bulletin No. 747448-A (1.1MB). Let us show you how DURA-SEAL™ III-NV can increase job quality, reduce down-time and enhance your productivity. We even offer a guarantee that is water-tight! Call today to place your order or to receive additional information. The DURA-SEAL™ III is a patented multi-finned flexible gasket which produces a positive water-tight fit wherever a pipe makes contact with a manhole base. It becomes an integral part of the pipe and cannot slip, twist or dislodge. If a flat spot of an out-of-round pipe does permit any leakage, DURA-SEAL’s™ simple four-step injection sealant system allows quick and easy repair, on-site. One man inside the manhole can complete the job without disrupting other workers or outside activities. The DURA-SEAL™ III works on pure compression, thus eliminating the need for installation kits, take-up clamps or additional tools. This makes installation in the field possible in either wet or dry conditions. The contractor simply lubricates the pipe and inserts it into place. This time-saving product provides you with top-quality, increased efficiency and improved cost effectiveness, all in one package. Let us show you how DURA-SEAL™ III can increase job quality, reduce down-time and enhance your productivity. We even offer a guarantee that is water-tight! Call today to place your order or to receive additional information. 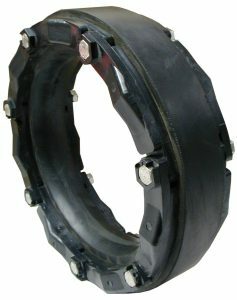 Blackthorn is pleased to offer Dura-Seal 6. 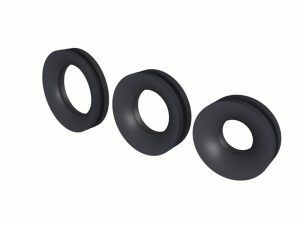 Dura-Seal 6 was developed to meet ASTM C 923-96 specifications for positive, watertight sealing of pipe-to-manhole connections. Test results are available. SEPTI-SEAL® is a patented, finned flexible gasket designed specifically for inlets and outlets on septic tanks. It can also be used effectively on other thin wall concrete structures that require a watertight seal. This durable pipe-to-tank connector is cast directly into the tank wall, which insures maximum watertight integrity. Septic tanks containing SEPTI-SEAL® gaskets have been vacuum-tested and have exceeded the standard 10 inches of mercury required by most engineers. SEPTI-SEAL® gaskets meet all material and performance requirements of ASTM C-923 specifications, for use on septic tank systems. SEPTI-SEAL® Gaskets Meet All Requirements To Satisfy ASTM C-923 Specifications For Use On Septic Tanks! 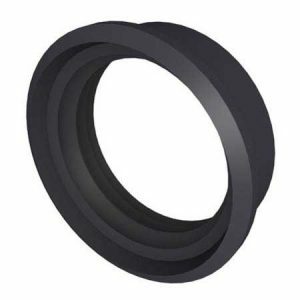 SEPTI-SEAL® gaskets provide you with a cost-effective, high-quality gasket system. You may obtain additional technical information and pricing by contacting us. SEPTI-SEAL® OFFERS MORE THAN JUST A TIGHT FIT!